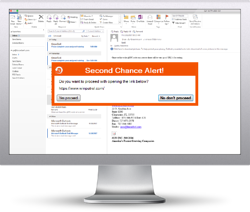 KnowBe4 is excited to announce Second Chance, a brand-new security tool for Outlook, Office 365, and Gmail email clients that you can download and deploy at no cost. Second Chance enables your user to make a smarter security decision by giving them a way to back out of that click. Requirements: Windows 7 (32 or 64 bit) and higher, all installed versions of Outlook 2010 and higher, .NET 4.0 or newer. Gmail and Office 365 web interfaces if the end user is using Internet Explorer 11 on Windows 7 or higher.